Meals at Valle Verde are an event, nourishment for the body and the spirit. Dining at Valle Verde reflects the Santa Barbara lifestyle. Choose from a variety of chef-prepared options in our dining room or casual poolside grill. We offer extended hours daily, and our flexible MyChoice dining program allows you to choose when, where and what you eat. Plus, your MyChoice points can be used to purchase locally sourced fresh produce through our dining department. Need a change? We’re a short distance from the many amazing dining (and winery) experiences Santa Barbara has to offer. 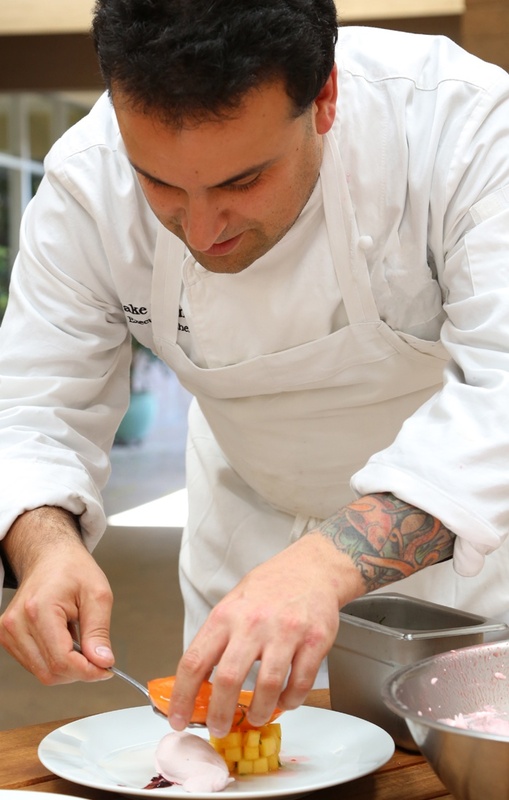 Chef Jake has been the executive chef at Valle Verde since 2013. His career spans more than 25 years training under some of the best French chefs in the country at four- and five-diamond properties. Previously he was a consultant for high-end restaurant and hotel groups, including a Relais & Chateaux Award-winning property. Q: What do you enjoy most about working at Valle Verde? A: That is easy; it has to be the people. The residents and the team have been a dream to work with for the last several years. The amount of support and enthusiasm for our dining program makes my job extremely engaging, fun and challenging in a positive way. A: You are as good as the things you cook with. If I could choose one style to cook, it would be peak California farm cuisine encompassing techniques from all over the world using fresh and local product to create unique cuisines. Product integrity is key. A: I would have to say that it is our daily catch on our Amigos Grill menu. Every day we have fresh line-caught fish from the Channel Islands that we lightly grill with Meyer lemons and extra-virgin olive oil with the chef’s preparation a la minute. A: I don’t know too many techniques that are secret anymore. Anyone can learn advanced modern gastronomy, but the real secret is carrying out the culture with the team of never getting comfortable with results. Every day we must strive to be better than the day before; it’s delivering surprise, delight and creating new experiences. See how delicious life at Valle Verde can be. Call (800) 750-5089 to schedule lunch.